Spiders may not be the most popular creatures – theres even a phobia named after them, but German art studentFriedrich von Schoor appears to have no problem with them! As part of a project at his art college, Friedrich used a video of some ordinary spiders trapped inside a small tank to create a terrifying scene, projected on to a full-size building. 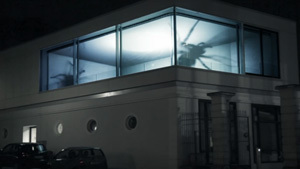 As can be seen in the video below, trick relies on the tank having exactly the same proportions as the building, allowing him to scale up the resulting video and place it accurately in its real-world location. It’s interesting how this illusion can be extended to anyglass-fronted structure, enabling us to see snakes inside the UN building, cockroaches crawling up London’s Shard… Like it? I LOVED it!